BDSwiss is a regulated CySec broker that was established in 2012. The company is a member of the investor compensation fund, thus ensuring that all clients’ money is in safe hands, with contingencies in place if for some reason the company should close. The company offers a number of different cryptocurrency options including Bitcoin, Litecoin and Ethereum. BDSwiss operates out of Cyprus and offers its services in a number of different languages and countries. The company is fully licensed and falls under the EU regulatory rules and therefore follows all financial regulations associated with this. BDSwiss uses SpotOption as their trading platform for the binary trades, but uses a separate platform for the Forex and CFD. The binary platform is very simple in its layout. Choosing an asset, expiry time, trade size and direction of the price are all simply done using the simple arrows and buttons that are displayed on the layout. There are also charts that are offered in different formats and provide varying timeframes that can be adjusted to suit the individual’s needs. 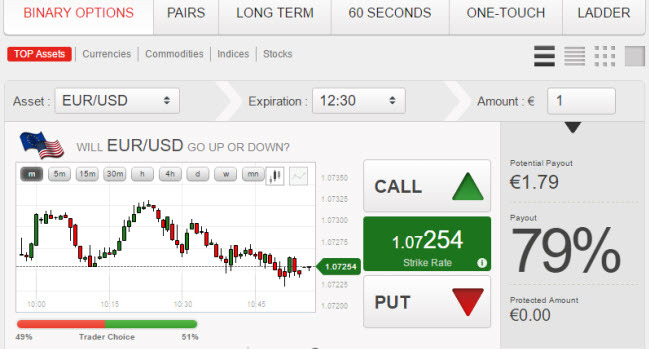 The Forex platform is much more advanced and can seem complex to those who are new to this trading world. Until recently the options for monetary transactions were somewhat limited, but in recent times the list of vendors available for deposits and withdrawals has grown. The aim of this was to allow their users to make transactions in the method they are most used to or comfortable with. Main options include the usual credit and debit cards, wire transfer and a number of e-wallet providers. BDSwiss takes its support seriously and offers a live chat function that is available to its traders in German, Italian and English. However, it is important to have an account already registered, as to access the live chat the user will need an email and a username. There is also support offered through an email and a telephone. The latter option has sixteen different languages available, which is one of the best levels of support coverage in the trading industry. There is a minimum deposit of just £10, which is one of the lower ones and trades can be done at a minimum of £1 and a maximum of £5000. BDSwiss offers a good overall service that includes a number of free signals including trading alerts. There are also signals that state the entry and exit points of all ventures, which help traders to plan their time accordingly. There is a mobile app on offer, which offers the same platform as the desktop version. The platform runs smoothly and even allows for up to sixteen different assets to be loaded at the same time, to allow for faster trading possibilities. Payouts can reach 85% although there are higher options depending on which trade type is used – Ladder options will reach the highest. There are strict terms and conditions to abide by and remaining inactive for a period of over six months will incur a 10% fee.